Cebu Pacific recently became the largest airline in the Philippines by domestic traffic and capacity, overtaking flag carrier, Philippine Airlines. The LCC has been going from strength to strength, expanding its route network and fleet, as PAL cuts back operations and slows growth, amid financial and labour difficulties. Traffic in the Philippines has continued to grow over the past 12 months, despite the global financial downturn and the financial difficulties of national carrier, Philippine Airlines. The Philippines' Civil Aeronautics Board (CAB) expects domestic and international passenger traffic to grow by 10-12% this year, due to cheaper fares and additional routes. CAB reported a 10.5% year-on-year improvement in domestic passenger numbers for the six months ended 30-Jun-2010, to 8.4 million. The growth was led by Cebu Pacific, which overtook PAL as the country’s largest carrier domestically. According to CAB, CEB handled 4.1 million passengers in 1H2010, while PAL handled 2.9 million. They were followed by Air Philippines (667,686), Zest Air (616,058) and Southeast Asian Airlines (SEAIR) (132,416). Internationally, Philippine Airlines remains the Philippines’ largest carrier. International passenger numbers to/from the Philippines rose 9.6% in the three months ended 31-Mar-2010 to 3.4 million. PAL handled 942,144 of these passengers, a 6.9% improvement for the quarter. Cebu Pacific handled 492,114 passengers, a 36% improvement, while Zest Airways handed 15,283. By overall capacity, Cebu Pacific is the largest carrier in the Philippines, operating 220,092 seats per week. 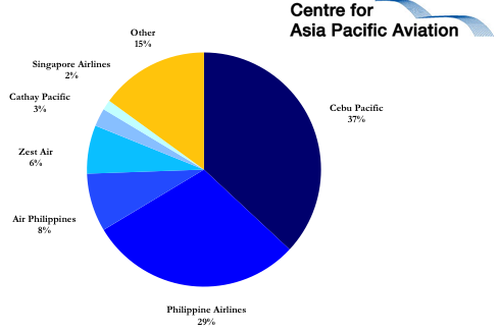 However, PAL and its subsidiary, Air Philippines, combined operate slightly more seats per week, with 223,482. Cebu Pacific expects to handle 10 million passengers this year, increasing to 13 million in 2012 and 15.1 million in 2013, as it takes delivery of 10 new A320 aircraft over the next three years. It handled 8.7 million passengers in 2009. CEB also expects revenue and profit growth of 30% for 2010. The carrier reported a 593% year-on-year climb in net profit for the 12 months ended 31-Dec-2009, to USD73.5 million. The improvement was the result of an 18.4% rise in revenue, to USD525.5 million, which included a 71% increase in ancillary revenue, to USD47.8 million. Operating costs meanwhile rose 10.9%, to USD454.8 million. More recently, the carrier reportedly posted a net income of USD68,272 in the first six months of 2010, with revenues of USD329.4 million. Cebu Pacific parent, JG Summit Holdings Inc, expects its operating income to increase by double digits on the back of earnings of its airline units. From Jan-2010 to Mar-2010, the company’s profit increased from USD26 million to USD121 million for the same period in 2009. JG Summit accelerated its capital expenditure from USD603 million to USD646 million in 2010 to support the growth of its subsidiaries. JG Summit has resumed plans to launch an IPO for Cebu Pacific and is looking to raise more than originally planned earlier in the year. The company is now looking to raise USD711.2 million (PHP32.2 billion), up from previous plans to raise USD568.5 million (PHP25.7 billion). Cebu Pacific will offer up to 214.6 million shares, including 30.7 million new common shares and up to 156 million shares, owned by CPAir Holdings. An additional 28 million shares have been put aside in case of an over-allotment. The carrier has also increased to maximum offer price from the previous PHP95 per share to PHP150 per share. Total proceeds, excluding the over-allotment, will be approximately USD100.8 million (PHP4.6 billion). ATR Kimeng Capital Partners Inc has been tapped as the lead domestic underwriter of the offering, while Deutsche Bank Ag, Hong Kong branch and JP Morgan Securities Ltd will act as joint global coordinators, book runners and international lead managers. Proceeds from the IPO will fund the company’s expansion programme, including new aircraft. JG Summit stated it is yet to decide the timing of the offering, which would depend on approvals from the stock exchange and securities regulator. The carrier has twice previously postponed its IPO plans. CEB first announced plans to launch an IPO in 2008, but suspended plans due to volatile markets. Earlier this year, the carrier announced plans for a PHP22.3 billion (USD494.7 million) offering in Mar-2010. CEB then delayed the offering at the end of Mar-2010 to after the Philippines’ national elections on 10-May-2010. The carrier had planned to launch a roadshow on 05-Apr-2010, with shares to be listed from 03-May-2010. However, at the end of May-2010, the carrier stated it was not a good time to push ahead with the share sale. Under the offering, JG Summit planned to offer 235 million common shares in the carrier, at a maximum price of PHP95 per share, with a further 35.3 million shares have been earmarked in case of over-allotment. A total 164.9 million of the shares were to be offered to international investors, while the remainder were to be offered to local investors. JG Summit was to earn PHP10.5 billion from the sale, with the carrier to keep the remainder to fund aircraft orders. Qatar Airways CEO, in Jan-2010, stated the carrier plans to launch an IPO in five years time, with CEO, Akbar Al Baker, stating the carrier is waiting for the right time to sell shares and "that would be possible after three consecutive years of profit gains". A key Saudi Arabian advisory body has recommended the carrier be sold of via an IPO, instead of via the current step-by-step privatisation process of the carrier’s units. The carrier had previously stated it would sell 450 million shares, or 30% of the company, in an IPO offering to be launched in 2011. Saudi Arabian Catering CEO, Christopher Parent, in Jul-2010 stated the Saudi Arabian Airlines unit is in the process of seeking regulatory approval to commence IPO proceedings, with an IPO scheduled to occur by Mar-2011. The airline plans to privatise its units individually. French bank Calyon has been chosen to advise on the IPO. Middle East Airlines Chairman, Mohammed Hout, in Apr-2010, stated the company would commence the process of partial privatisation this year, adding that he expects shares in the carrier to commence trading on the Beirut Stock Exchange by 2011, once the IPO process has been completed. The carrier plans to sell a 25% stake in the company on the market. Middle East Airlines has six banks interested in IPO. The carrier, later in Apr-2010, added that six banks had expressed interest in managing the partial IPO. MEA is valued at USD1 billion and a stake sale is expected to raise up to USD250 million in 2010. No single investor is permitted to own more than 1% of shares, which will be listed on Lebanon’s stock exchange. The carrier's initial plans to partially privatise the company in 2008 were delayed by the global economic crisis. No further details have since been disclosed. Emirates Chairman and CEO, Sheikh Ahmed bin Saeed Al Maktoum, in 1Q2010, stated the carrier would be ready to launch an IPO whenever the UAE Government takes the decision. Sheikh Ahmed stated the carrier will “always be ready”. National Air Services, parent company of Nasair, in late Apr-2010, announced regulatory approval to become a joint-stock company with capital of USD267 million in preparation for the launch of an initial public offering. Approval is still required from financial institutions. Nasair expects to return to profitability in 2010. The carrier postponed plans for an IPO in 2008. Kuwait Airways in Aug-2010 stated the legal transfer of the carrier to a new private shareholding company is scheduled to be completed by 01-Mar-2011. The Board of the new company, which will have capital of KWD220 million (USD769 million), will be elected by Saudi Arabia's General Assembly. Once the transfer is completed, the public will be invited to subscribe. The carrier has appointed Citigroup, Ernst & Young and Seabury to handle the privatisation of the national carrier. The Kuwaiti Parliament has approved plans to sell 40% of the carrier to the public and 35% to a long-term investor. Iran Air Chairman, Farhad Parvaresh, stated in Jul-2010 that the carrier plans to launch an IPO with a listing on the Tehran Stock Exchange, at between 60-100% of stock. Iran Air subsidiary, Homa Hotels, is already listed, with Iran Air Tour expected to launch an IPO by the end of the Iranian calendar year, 20-Mar-2011. No timeframe was disclosed. The airline plans to use the funds to finance the acquisition of up to 100 new aircraft and spare parts from Boeing and Airbus. Iran Air operates a fleet of 53 Boeing, Airbus and Fokker aircraft, with an average aircraft age of 21 years. AirAsia CEO, Tony Fernandes, stated in Jun-2010 that the group plans to offer 30% of Indonesia AirAsia and Thai AirAsia in their IPOs next year. AirAsia X is eyeing a public listing in the 2H2011, subject to market conditions. The carrier is reportedly considering a listing on a foreign stock exchange, with options including the London, Hong Kong and New York stock exchanges. The IPO is likely to value the carrier at USD500-600 million. AirAsia X is 48% owned by Aero Ventures Sdn Bhd, while Virgin Group and AirAsia Bhd each have a 16% stake in the LCC. Orix Group and Manara Consortium each own 10% stakes. The carrier will remain majority owned by Malaysians. Parent, JG Summit Holdings Incs stated in Aug-2010 that it plans offer up to 214.6 million shares, including 30.7 million new common shares and up to 156 million shares, owned by CPAir Holdings. JG Summit is aiming to raise USD711.2 million (PHP32.2 billion) from the offering. Garuda now plans to launch its IPO at the end of Nov-2010, after the Indonesian Government has delayed the offering a number of times during the year to allow the carrier to complete its debt restructuring. The carrier plans to sell 25% of its shares to raise up to USD400 million, to fund new aircraft and enhance operations. Spring Airlines spokesperson Zhang Wuan stated in Jul-2010 that the carrier is on track to launch an IPO in Mainland China next year to fund fleet expansion plans, targeting 100 aircraft by 2015. Juneyao stated in Jun-2008 that it plans to launch an IPO in 2010. The Shanghai-based carrier is considering launching the IPO on the Shanghai stock market, but is yet to make a final decision on the location of the listing. The carrier plans to raise up USD293 million (CNY2 billion) to expand the Juneyao Airline’s fleet. Star Flyer in Jul-2009 stated it has established an internal committee to study and prepare for the airline's upcoming IPO. The process was expected to take approximately three months, with the first step being to study compliance and corporate management structures for the planned privatisation. The Japanese carrier has previously stated that it would conduct the IPO in 2010. It was reported that Air India parent, the National Aviation Company of India Ltd (NACIL) plans to launch an IPO to fund the acquisition of aircraft and boost its restructuring programme, following the appointment of four independent directors to its Board of Directors on 08-Mar-2010. The proposed size of the IPO was not disclosed, however, the Indian Securities and Exchange Board requires companies to offer minimum 10% equity, unless a company has achieved three years of profitability. Indigo Airlines parent, InterGlobe Aviation Ltd, reportedly appointed four investment banks for an IPO for the carrier to raise up to USD339 million. The banks include Morgan Stanley India Co, Citigroup Global Markets India, UBS Securities India and Credit Suisse Securities (India). The timeline for the IPO was not disclosed, but InterGlobe recently stated it has no plans to launch the offer immediately. Portuguese Government proposed a privatisation plan for 2010-2013, to lower its sovereign debt, involving TAP Portugal and ANA-Aeroportos de Portugal. The plan was to be discussed in Parliament in Mar-2010 before being submitted to EU authorities. Further details have not been disclosed. The government expects to raise approximately EUR1.2 billion from plans to privatise state assets. Pegasus Havayollari Chairman, Ali Sabanci, stated in Jun-2010 the LCC plans to conduct an IPO of up to 25-30% in 2010. However, he added the IPO could be postponed to 2011 if market conditions were not favourable. Pegasus also confirmed it purchased a 5% stake in Air Lease Corporation in Jun-2010. 60% of the IPO will be open to foreign investors. LAN Peru President, Emilio Rodriguez, stated earlier this year that LAN Airlines wants to list shares on Lima's Stock Exchange and put up to 20% of all shares for sale to domestic investors. However, these plans have been affected by a new capital gains tax of 30% that Congress approved in Dec-2009. The carrier is now examining how foreign issuers in Peru can obtain a better context in which to list. Pluna reportedly plans to launch an IPO in the US within the next three to five years, which would make the carrier the first Uruguayan company to offer shares in the US. CEO, Matias Campiani, stated the carrier would probably offer shares in New York, but may consider also listing in the Uruguayan market. 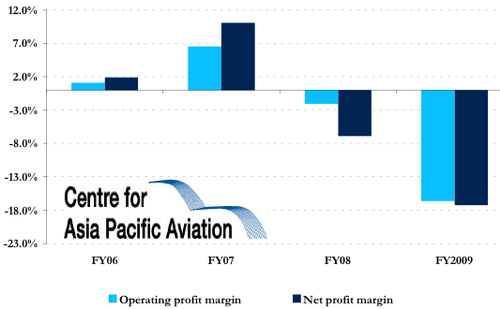 Porter Aviation Holdings in Jun-2010 decided not to proceed with the previously announced proposed offering of its common equity due to unfavourable market conditions caused by volatility in the equity markets. Porter has planned to sell 17.1-20 million shares for CAD6 to CAD7 each, before cutting the price to CAD5.50 on 31-May-2010. CEO, Robert Deluce, stated the carrier would consider plans to launch an IPO later in 2010 if conditions improved. CEB plans to take delivery of three more A320 aircraft during 4Q2010. Powered by CFM56 engines, the new aircraft will join a fleet of 21 A320s. The fleet has an average age of 2.8 years. CEB has a total of 25 new aircraft on order, to be delivered up until 2014. The orders are to be funded through internally generated cash and support from the European Export Credit Agency. CEB has allocated USD1.4 billion over the next five years for its aircraft purchases. The carrier has been ordering new aircraft to expand domestic and international operations. It has launched a number of routes this year, while also increasing frequencies on existing services. CEB received approval to increase Manila-Singapore frequency to 32 times weekly, following the signing of a new bilateral agreement between the Philippines and Singapore. The carrier has also announced plans to increase frequencies on a number of international services, as part of its expansion plan in the Asia Pacific region. 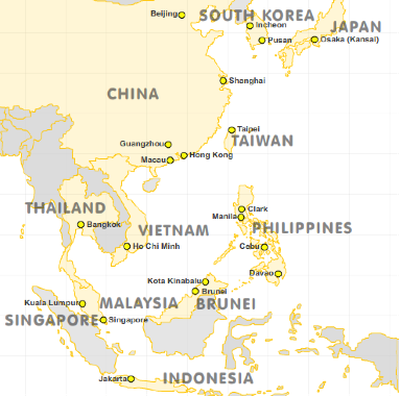 Destinations include Kota Kinabalu,Taipei, Singapore, Kuala Lumpur, Jakarta, Seoul, Macau and Hong Kong. The carrier stated Hong Kong is its strongest international destination, based on the number of passengers last year. 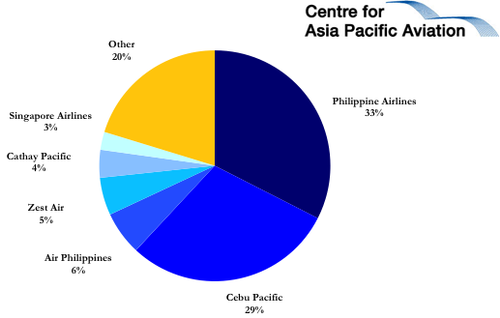 CEB flew approximately 493,000 passengers in 2009, more than other Cebu Pacific international destinations. CEB also launched Manila-Bandar Seri Begawan service on 21-Aug-2010 and plans to launch Manila-Beijing service on 05-Sep-2010 and Laoag-Macau service on 20-Sep-2010. 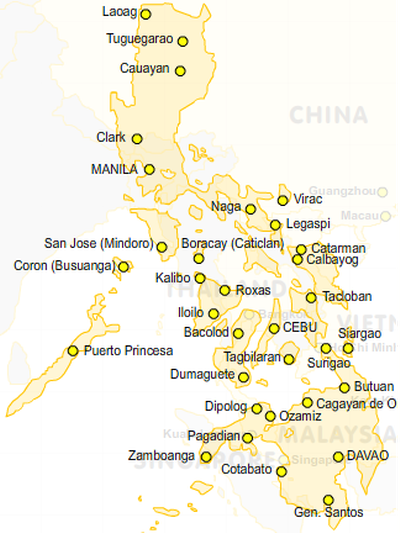 Domestically, CEB announced plans to increase frequencies from Manila to Cagayan de Oro, Pagadian and Davao from 27-Oct-2010. The carrier also plans to increase capacity on services from Cebu and Davao to Zamboanga, replacing 72-seat ATR 72-500 aircraft with a 156-seat A320 from 24-Nov-2010. It also recently launched services to Surigao and Pagadian. The LCC has been launching fare sales aimed at traditional bus routes in an effort to take market share, and not just from airline competitors. Meanwhile, Philippine Airlines is no longer confident it can return to profit this financial year (FY2010-11), following a spate of labour issues over the past few months. The carrier remained profitable in the three months to Jun-2010, albeit at reduced levels. The carrier reported a net profit of USD31.6 million, a 11% year-on-year decline, despite a 30.2% increase in revenues to USD426.7 million. Total costs increased at a greater rate, by 37.2% to USD391.6 million. During the period, the airline benefited from improvements in passenger traffic as well as cargo, reflecting signs of economic recovery worldwide. Higher yields generated per seat offering also complemented growth in passenger demand. PAL expects to handle more than 9 million passengers this year, with a slight drop in international traffic and “modest” domestic growth. However, PAL now expects lower passenger numbers during its "lean season", typically between August and November. PAL President and COO, Jaime Bautista, stated that although the aviation industry is showing signs of “slow recovery”, the carrier remains focussed on boosting revenues and controlling costs. He added in order for the carrier to move forward, it “must swallow bitter pills and handle its labour issues with utmost care”. During its last fiscal year ending Mar-2010, PAL reported a net comprehensive loss of USD14.5 million, despite a USD35.5 million profit during the first quarter. Revenue for the year, dropped by 15%, to USD1,360 million, as totals costs were reduced by 27.4%, to USD1,350 million. PAL attributes the loss to continuing weak demand, particularly in the international market. PAL stated it will continue to introduce revenue enhancement programmes, cash generating strategies and cost control initiatives, including the proposed outsourcing of three of its non-core units. The carrier attributed the loss to weak demand, particularly in the international market. PAL stated it will continue to introduce revenue enhancement programmes, cash generating strategies and cost control initiatives, including the proposed outsourcing of three of its non-core units. Mr Bautista stated the carrier’s current financial difficulties are not the result of prematurely exiting rehabilitation, attributing losses to the global economic environment. Mr Bautista stated it is still complying with its rehabilitation plan, despite its failure to meet profit targets. Philippines’ Securities and Exchange Commission (SEC) approved the carrier’s early exit from rehabilitation in 2007. Prior to its labour issues, PAL had been in talks with a number of potential investors, including fund managers and Asian carriers, to improve its financial standing. Mr Bautista stated the carrier’s current shareholders have been seeking an infusion of fresh capital, through the issue of new shares. However, it has put these talks on hold for the past two months, as investors have advised PAL to resolve the issues before asking for any capital infusion. Mr Bautista stated the airline is in search of new investors as if PAL Holdings Chairman, Lucio C Tan, choses to sell his shares in PAL, the money will go directly to him and not to the airline. Mr Tan meanwhile stated Philippine Airlines would not be sold by the company, despite ongoing losses. PAL’s shareholders recently approved plans to cut the par value of the carrier’s shares from PHP0.80 to PHP0.20. The move will allow outside investors to more easily acquire a larger voting block in the carrier. Shareholders also approved plans to increase PAL’s authorised share capital from PHP16 billion to PHP20 billion, divided into 100 billion shares. Mr Bautista stated the shareholders approved plans to implement a quasi-reorganisation of the carrier last year, but PAL was unable to implement the plans as it was unable to attract new investors. PAL now hopes to implement the reorganisation this year, which it believes will “improve liquidity and improve [the] working capital position of the company”. To minimise losses resulting from rising fuel prices, the carrier recently increased its fuel surcharges on international routes, including Bangkok, Singapore, Indonesia, Hong Kong, Macau, Xiamen, Beijing and Shanghai. Under its plans to improve its financial standing, the carrier announced plans to spin off three non-core businesses - in-flight catering services, airport services and call centre reservations operations – to reduce its workforce from 7,500 to 3,000. These plans were approved by the Philippines’ Department of Labour and Employment (DoLE). PAL has stated it plans to outsource call centre operations to ePLDT Ventus, catering services to SkyKitchen Philippines and cargo handling services to Sky Logistics. It also plans to downsize its medical, information technology and human resource units. The outsourcing is expected to save PAL USD11 million-22 million p/a. PAL has put aside up to USD55 million to compensate staff. Separation benefits to be provided include one month salary for every year of service and non wage benefits, including free fares. However, the plans led to commencement of a number of labour issues for the carrier. PAL Employees Association (PALEA) sought to reverse DoLE’s decision permitting the spin-off plans. The union stated the carrier does not have sufficient bases for retrenching workers as this should only be done in the case of serious and imminent losses. The associated added PAL’s business condition is in fact improving, not deteriorating, thereby negating the necessity for retrenchment. Mr Bautista defended the plans, stating outsourcing has become common practice in the airline industry and it has no choice but to do so in the current environment, which is “already out of our control”, due to “unabated liberalisation” of the industry, “record-high” fuel prices, the downgrade of the Philippine aviation sector to Category II by the US and subsequent blacklisting of Philippines' carriers by the EU. He added that if the carrier goes ahead with the restructure, PAL will be close to the ideal employee-per-aircraft ratio which is less than 100 to one widebody. PAL has 19 widebody aircraft. PAL responded stating it would continue with the plans, despite having to delay the restructuring programme from the originally planned date of 31-May-2010 due to the union objections. The issue has sparked a number of other labour issues, including the recent resignation of a number of pilots and plans by cabin crew to launch strike action due to a lack of pay. The 25 resigned PAL pilots are understood to have left the carrier for higher wages at other airlines, including Hong Kong Airlines. PAL previously called for the pilots to return to the carrier, agreeing with the Philippines Government and the Airline Pilots Association of the Philippines to take the staff back without any sanctions. None of the staff have returned to the carrier. Mr Bautista remains adamant the carrier is unable to match the salaries of other airlines due to PAL’s financial struggles. The carrier stated the resignations were a violation of their contracts with the carrier, as well as pertinent government regulations that require resigning pilots to give PAL six months prior notice to be able to train their replacements. PAL now plans to file appropriate charges against the pilots. According to the carrier, most of the pilots still owe PAL the cost of their aviation school training, which run into millions of pesos per pilot. Airline Pilots Association of the Philippines (ALPAP) claimed the issue is not just the result of wanting better pay, but that its members were being forced to sign less attracting contracts to work at PAL’s LCC subsidiary, Air Philippines. PAL denied the claims. PAL warned the government that if its pilots issues continue, the local airline industry may soon collapse. The carrier has requested the government give the airline time to find replacement pilots, as it cannot stop pilots from leaving PAL. Flight Attendants’ and Stewards’ Association of the Philippines (FASAP) has stated Philippine Airlines flights have been operating “undermanned” for the past two years, “adversely” affecting services. FASAP also said a number of cabin crew have also transferred to foreign airlines, due to a lack of tenure security and labour issues. According to FASAP Vice President, Andy Ortega, PAL has saved USD5.2 million over the past three years from reducing its cabin crew. The union is now demanding a salary increase for its members and a lifting of the mandatory retirement age to 60. FASAP has also expressed concerns over the airline’s “arbitrary crew reduction” policy. Mr Bautista responded stating the carrier is in the process of using international standards to improve operations, including a reduction in in-flight crew numbers on trans-Pacific services. FASAP responded stating the reduction would downgrade PAL’s in-flight service rather than improve it and called on the carrier to share its savings made from the reduction in cabin crew with the remaining staff. PAL management offered a USD1.8 million (PHP80 million) package to its flight attendants and stewards to settle and close their collective bargaining agreement (CBA) for the period 2005-2010. The offer was made at the resumption of CBA talks between PAL management and officers of FASAP at the National Conciliation and Mediation Board (NCMB). PAL said the “one-time” package is the only amount it could offer the union due to the company’s "dire fiscal condition". The carrier added it is up to FASAP to determine how it will divide the PHP80 million among its 1,600 members. Furthermore, PAL management expressed its desire to move discussions on the retirement age issue for the 2010-2015 CBA. It said the priority is to put a closure to the previous 2005-2010 CBA which has been under discussion for the past three years. Under the existing CBA, male and female flight attendants who were hired before Nov-1996 would be retired once they reach 60 and 55 years old, respectively, and those hired from 1996 and beyond would be retired at age 45 for both males and females. Those hired after Nov-2000, on the other hand, will be retired by the age of 40 for both males and females. Mr Baustista commented that as those to be affected by retirement ages of less than 60 are still a number of years away from being effected by the issue, negotiations could be postponed. However, FASAP rejected the package, stating it was “not enough”, considering PALEA members were offered a 5-10% salary increase. FASAP also commented that it still wants the retirement age to be 60 years of age, “no more, no less”. The association secured a temporary restraining order (TRO) from a Metro Manila lower court for PAL to withdraw the compulsory retirement policy, as it was found to be discriminatory. FASAP now plans to request the court order PAL to rehire any cabin crew already affected by the order and provide them with due compensation. FASAP have now also threatened strike action due to PAL’s refusal to improve its offer and its requests to move talks on the mandatory retirement age to its next CBA. PAL remains confident it can resolve the issue with the help of the DoLE, but stated it has lined up measures including the deployment of administrative staff and other personnel to help in case of emergency. It added that passenger can be transferred to any of its 134 interline partners if strike action is launched. DoLE stated it is willing to immediately resolve the labour dispute between Philippine Airlines and its cabin crew, once the case is filed before the agency. However, Labour Secretary Rosalinda Baldoz stated it was to early for the department to intervene after FASAP withdrew from talks. According to DoLE, there is a 30-day cooling off period after a notice of strike is filed, during which DoLE will mediate if such a notice is filed by FASAP. A number of tourism industry members have called on the government to help PAL resolve its labour issues. However, the government stated it still sees no need to become involved in the carrier’s labour issues, despite Tourism Secretary, Alberto Lim, stating the looming strike would create an “emergency” situation for the country’s tourism industry and PAL would suffer heavily. The government stated it has developed contingency plans should PAL’s labour issues get out of hand, admitting that it has discussed taking over the airline, but would prefer to use other options to overcome the issue. The government is now considering liberalising its air services, should PAL’s cabin crew go ahead with the planned strike action. The Philippines plans to temporarily implement an open skies policy, and is in talks with foreign carriers to operate additional services to the country. The government is willing to grant special permits to Asian, Middle Eastern and North American carriers to serve international routes similar to PAL’s. The Philippines already has an open skies agreement with the Association of Southeast Asian Nations (ASEAN), but this covers only Manila Ninoy Aquino International Airport (NAIA). However, CAB Deputy Executive Director, Porvenir Porciuncula, stated the board may have difficulty finding airlines to service affected routes. Furthermore, Mr Porciuncula added that although a number of domestic airlines are also operating on PAL’s routes, capacity adjustments would need to be made, which the carriers may not be able to handle. SEAIR and Spirit of Manila Airlines (SOMA) have so far expressed interest in operating PAL routes during the industrial action. SOMA only operates Clark-Taipei service at present, while SEAIR’s additional services ware contingent on the delivery of leased aircraft. SEAIR plans to lease two A320s to Tiger Airways. PAL welcomed the government’s decision to consider opening the country’s skies to foreign carriers as one of government’s options should the flag carrier and its workers fail to resolve their differences, describing the move as a “wake up call”. Mr Bautista stated the carrier is looking to overcome its labour issues, but unions must recognise the carrier's financial situation. The President also commented that an Open Skies policy should be viewed in the context of available infrastructure such as NAIA’s congested single runway, overburdened terminals and the country’s negative image as a tourist destination. As he welcomed calls for more relaxed access to the Philippines, he said all airlines with existing capacity rights to Clark, Cebu, Davao and other areas should be encouraged to mount more flights to these areas to decongest Manila and promote nationwide tourism. At NAIA, Philippine Airlines has the majority of the market by capacity, operating 222,925 weekly seats. Foreign carriers, Cathay Pacific and Singapore Airlines have 4% and 3% shares, respectively. The government previously temporarily implemented an open skies policy when PAL was last experiencing labour issues in the 1990s. Mr Baustista stated earlier this year the carrier’s profitability for FY2010-11 would be dependent on whether it can launch services to the US. This is looking less likely, with the country’s US Federal Aviation Administration (FAA) safety rating still at Category 2. PAL plans to launch services to Chicago, New York and San Diego, and will consider additional services to Los Angeles and San Francisco subject to demand. The airline also operates to Las Vegas. The carrier hopes the FAA will raise the country’s rating to Category 1 in the next six months. However, Philippines carriers, particularly PAL, have been limited in their international expansion plans over the past few years, as the country remains under the FAA Category 2 safety rating and was added to the European Union’s airline blacklist earlier this year. Despite the rating, the FAA continues to allow PAL to operate up to 33 regular weekly flights from the Philippines to Los Angeles, San Francisco, Honolulu, Las Vegas and Guam. PAL also plans to decide over the next 12 months if it will exercise options for a further four new B777-300ER aircraft, depending on whether the US FAA upgrades the Philippines' safety category. The carrier had planned to take delivery of the first two of these aircraft in Sep-2010 and the remainder in early 2011. However, the carrier was forced to delay the deliveries of two of these aircraft due to the financial downturn. Also affecting PAL’s international expansion plans, Philippines carriers were placed on the EU’s blacklist at the start of Apr-2010, due to “serious safety deficiencies” found by the United Nations and FAA. Two events led to the inclusion of Philippine carriers in the EC ban, namely: the FAA’s downgrade and the “significant safety concern” findings by ICAO in Nov-2009 against Philippines aviation safety regulators. The European Commission acknowledged efforts from PAL and Cebu Pacific to improve safety standards but stated it would deny all 47 Philippines carriers from flying into the region until remaining concerns are addressed. Civil Aviation Authority of the Philippines (CAAP) Director General, Alfonso Cusi, stated that although the airlines are listed on the EU blacklist, it does not mean their aircraft are unsafe, with all aircraft meeting international standards of safety. CAAP has now commenced hiring of 47 aviation safety experts, improved surveillance and inspection process and plans to ground small domestic operators if they are not certified by Dec-2010. Philippine Airlines had reportedly been considering resuming operations to Europe after talks for bilateral air service agreements were recently concluded with European countries, including the UK. PAL suspended operations to Europe in 1999. In response to the black-listing, PAL stated it was “gravely concerned” over the decision and assured passengers that safety “remains the bedrock” of its operations. It has been in compliance with IOSA since 2006. CEB also expressed its disappointment in the decision and assured passengers of its safety standards. CEB became the first airline worldwide to achieve ISO certification. CEB has since then gained the upgraded ISO9001:2000 certification in 2003 and the ISO 9001:2008 in 2009. However, the country’s efforts to improve safety standards appear to be working, with ICAO providing a “positive” response to the CAAP’s "corrective action plans" in May-2010. ICAO’s Safety Oversight Audit (SOA) reviewed the plan and stated it was "found to fully address most of the findings and recommendations contained in the report". European Aviation Safety Agency (EASA) now plans to visit the Philippines to conduct an audit on progress in improving its aviation safety standards on 18-Oct-2010 to 22-Oct-2010. The outcome of the visit is to be reviewed by the European Union at the European Union Air Safety Conference in Nov-2010. CAAP is seeking only a partial lifting of the ban to allow Philippine Airlines and Cebu Pacific to operate to Europe. Although CEB has never planned to launch operations to Europe, Mr Cusi stated that “according to the union’s standards” the carrier must be cleared as it is one of the country’s major carriers. Other Philippines carriers generally have smaller fleets and focus on domestic operations. Zest Airways (formerly Asian Spirit) operates scheduled domestic and international tourist services, predominantly feeder services between Manila and Cebu and 24 domestic destinations. The airline was originally founded as Asian Spirit in Sep-1995 with operations commencing in Apr-1996. In Sep-2008, Asian Spirit announced it would be rebranded as Zest Airways. South East Asian Airlines (SEAIR) is the second-oldest airline in the Philippines. The carrier, headquartered in Pampanga with a main base at Manila Ninoy Aquino International Airport, operates the most number of flights to Palawan and the largest number of connections to Boracay. SEIAR is privately owned, with local investors holding a 60% stake, and the remaining stakes held by Nikos Gitsis (10%) and Iren Dornier (30%). Elsewhere, PAL launched twice weekly Manila-Brisbane via Melbourne service on 17-Mar-2010, as part of its expansion plans in the Australian market. Brisbane is the carrier's third Australian destination and 25th international destination. PAL also operates five times weekly from Manila to Sydney and Brisbane. 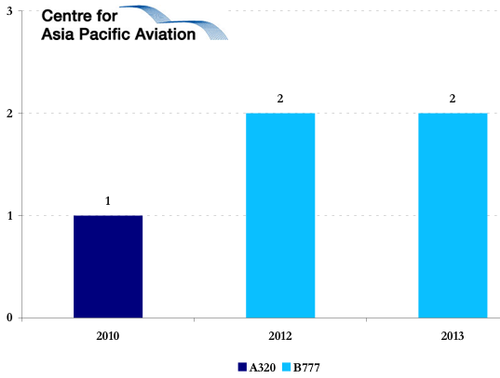 Australian operations have been quite positive for PAL, with the carrier stated it has increased its FY2010 target revenues for Australia by 52% to USD64 million in 2010, with a 10% increase in passenger traffic between the Philippines and Australia. Country Manager Australia, Arnul Pan, stated the carrier is "optimistic about our targets because of higher and better carriage with our new Airbus A330 planes". 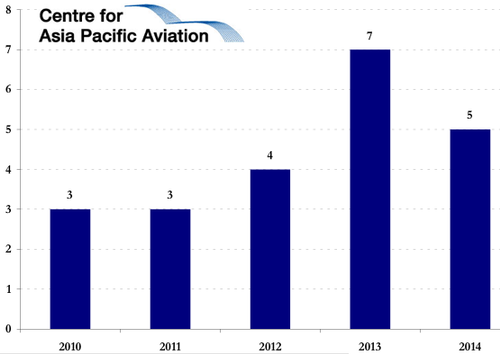 He continued: "Our market has also expanded after Brisbane was added to our route" in Mar-2010. The carrier is now looking to expand to India and plans to launch three times weekly Manila-Delhi service by Mar-2011, using A330 equipment. PAL also recently received approval to operate additional frequencies to Singapore. The airline received an additional 700 seats, meaning it can now operate 32 times weekly service. Air Philippine also received approval to launch daily service on the route, while competitor, Zest Air is also now able to operate daily service. Domestically, PAL recently released a new schedule to further optimise operational efficiency as the travel sector enters the "lean season" and it continues to operate with a smaller number of pilot crew. The schedule took effect on 09-Aug-2010 and will continue to 30-Nov-2010. Based on the list submitted by PAL to the Civil Aeronautics Board, routes with reduced frequencies include those to/from Manila and Ozamiz, Dipolog, Puerto Princesa and Cebu. Meanwhile, the carrier also plans to temporarily suspend Cebu-Davao service. This route will be reinstated during the peak season.